1 GCVS Team [Fe/H] = -1. P var. Min I = 2377165 + 142.8d*E (JD2377160 - 9820); Min I = 2384885 + 142.6d*E (JD2384890 - 8170); Min I = 2394451 + 141.4d*E (JD2394450 - 8500); Min I = 2398777 + 142.4d*E (JD2398770 - 2404320); Min I = 2404627 + 137.4d*E (JD2404600 - 6410); Min I = 2406561 + 142.7d*E (JD2406560 - 9065); Min I = 2409742 + 143.6d*E (JD2409730 - 12700); Min I = 2412755 + 141.5d*E (JD2412750 - 16720); Min I = 2417161 + 139.5d*E (JD2417150 - 20790); Min I = 2421083 + 143.4d*E (JD2421050 - 25170) [K.Mora, Bud Abh 1, N3, 1934. 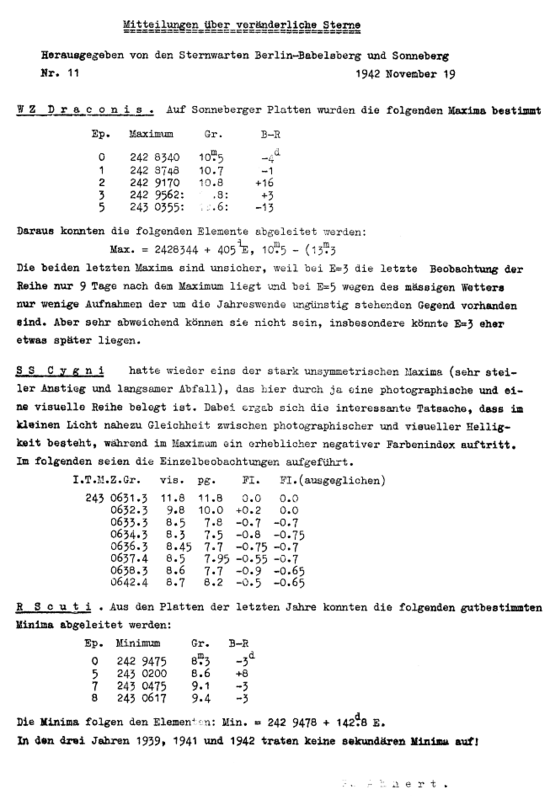 ]; Min I = 2429478 + 142.8d*E (JD2429000 - 30650) [P.Ahnert, MVS N11, 1942. ]; Min I = 2432078 + 140.05d*E (JD2432000 - 42240) [J.Bauer, BAV-R 22, N1/2, 5, 1973. ]; Min I = 2442737 + 152.5d*E (JD2442550 - 43050); Min I = 2443315 + 138.5d*E (JD2443050 - 44150) [General Catalogue of Variable Stars, 4th Edition, Volumes I-III, P.N. Kholopov et al. ]; since JD2444150 - see Table. Light curve drawings [K.Mora, Bud Abh 1, N3, 1934., M.W.Mayall, PA 59, 383, 1951., J.Bauer, BAV-R 22, N3/4, 29, 1973.]. Spectrum description [S.B.Howell, B.W.Bopp, P.V.Noah, PASP 95, 762, 1983., J.A.Cardelli, AJ 90, N8, 1494, 1985. ].